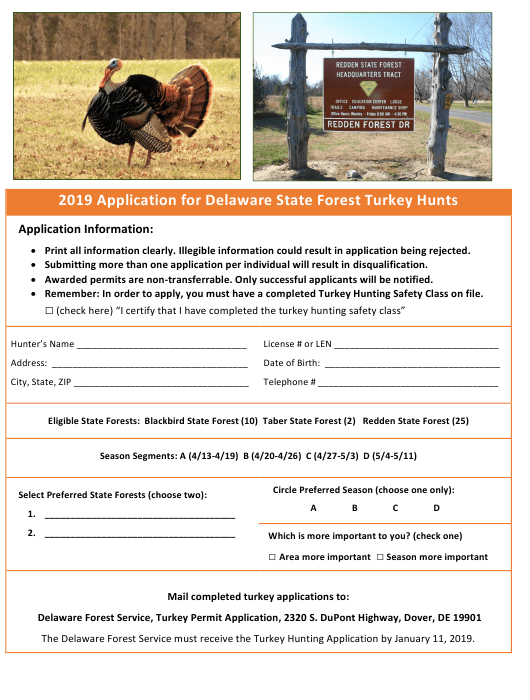 This fillable "Application for Delaware State Forest Turkey Hunts" is a document issued by the Delaware Department of Agriculture specifically for Delaware residents.  Print all information clearly. Illegible information could result in application being rejected.  Submitting more than one application per individual will result in disqualification.  Awarded permits are non-transferrable. Only successful applicants will be notified.  Remember: In order to apply, you must have a completed Turkey Hunting Safety Class on file. The Delaware Forest Service must receive the Turkey Hunting Application by January 11, 2019.